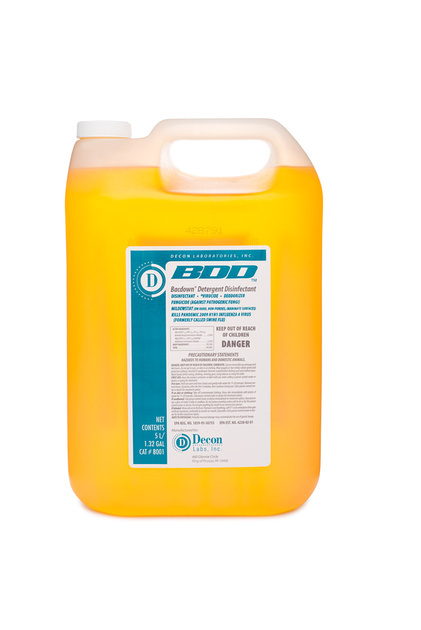 BDD™ (Bacdown® Detergent Disinfectant) is a concentrated quaternary (quat) disinfectant that will safely and effectively clean and disinfect surfaces in labs, production areas and process equipment. Diluted two (2) ounces per gallon of water (1:64), BDD™ is a bactericidal, virucidal, fungicidal and provides effective biological decontamination against HIV-1, HBV and more when used as instructed. Conforms to OSHA’s Blood borne Pathogens Standard. EPA registered.